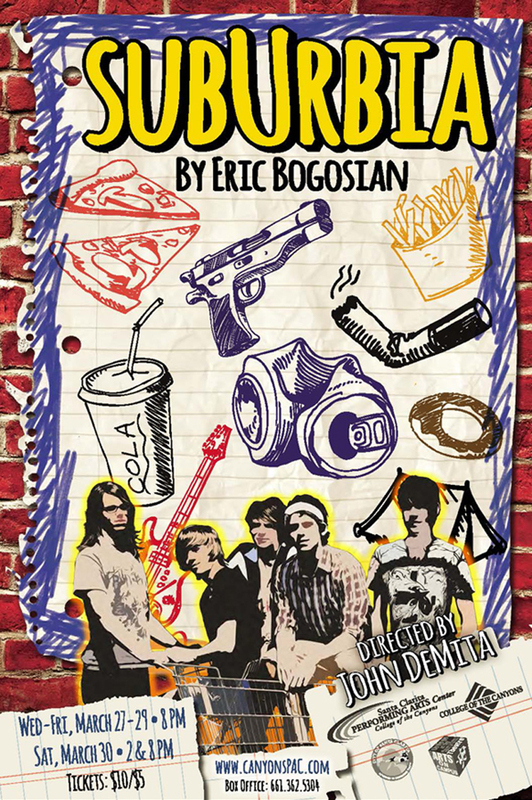 The COC theatre department will present playwright Eric Bogosian’s gritty, but comedic, drama “subUrbia” for one weekend March 27-30 at the Santa Clarita Performing Arts Center (PAC) Black Box Theater. Focusing on themes of escape, personal re-invention and the American dream, “subUrbia” follows the evening activities of a group of aimless 20-somethings living in suburban New Jersey. But when a chance encounter with a former classmate turned successful musician stirs the emotions of the group, each begins to examine the lies and excuses that have combined to keep them stuck in a seemingly meaningless, dead-end existence. The cast of “subUrbia” will be composed entirely of students from the college’s theatre department. Performances will run at 8 p.m. March 27-29 and 2 p.m. and 8 p.m. Saturday, March 30. Tickets are $10 for adults and $5 for students/seniors. Seating will be available on a first come, first served basis, but may be limited. This production contains profanity and adult situations and is recommended for mature audiences only. Children under the age of 5 are not allowed in the theater. The cast of “subUrbia” will be made up of an eclectic mix of COC theatre majors, with some having participated in a number of recent COC theatre productions and others performing at the college for the very first time. Meanwhile, newcomer Austen Parros will have his opportunity to shine in the role of ‘Tim.’ Parros is returning to the theatre, his stated “first love,” after serving in the United States Air Force as an aerospace propulsion journeyman, otherwise known as a jet engine mechanic. Playing the role of ‘Sooze’ will be Bre Combs, who joined the cast after initially serving as an assistant stage manager for the production. Combs — a past recipient of the college’s Jay and Joyce Rodgers Performing Arts Scholarship — will return to the PAC main stage after having appeared in the COC production “The Heidi Chronicles,” as well as the 2012 New Works Festival. For more information or to purchase tickets visit www.CanyonsPAC.com or call (661) 362-5304.